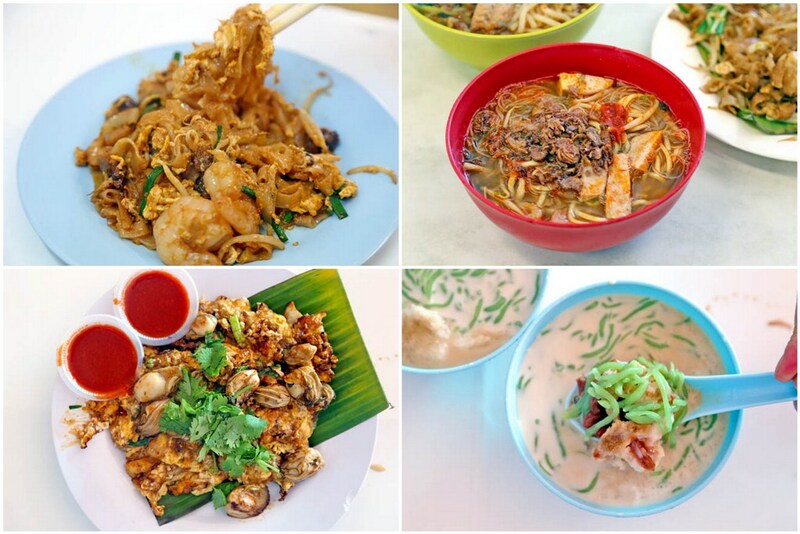 10 Best Street Food In Penang – The Penang Food Guide! [Penang, Malaysia] You can probably find some of the best street food in Penang alone, and it is there I discovered many old-school familiar tastes and nostalgic sites at every corner, especially around the charming George Town. Penang is also the first overseas place I ever visited as a child, thus there are many fond memories associated. I love watching how the hawkers stir up a plate of fried noodles with such gusto and passion. Growing up in a fast urbanizing city, it’s a sight I miss. 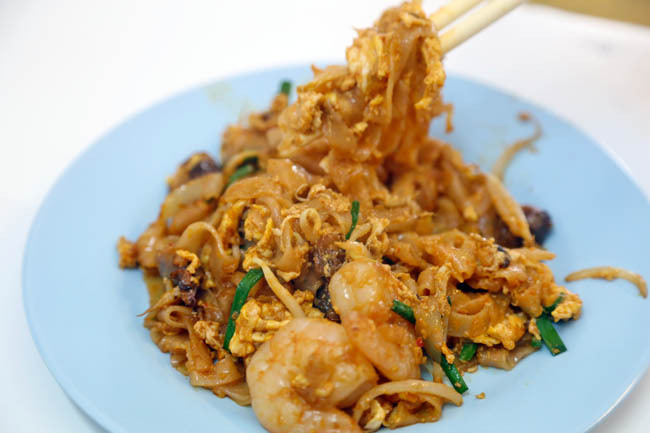 Many Penang locals call the Char Koay Teow, stir-fried rice noodles, the best street food. 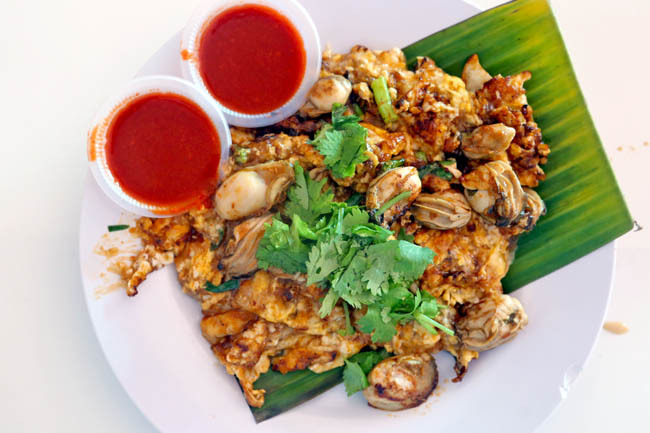 Some Penang versions use generous portions of seafood, duck eggs, and fry them on charcoal stoves skillfully, creating this distinctive ‘wok-hei’ (heat) which makes every mouthful hugely satisfying. The Penang style is usually sweeter and lighter than Singapore’s dark version. While Taiwan has its own thick sweetish kind, and Thailand a crisper version, I still enjoy Penang’s Oh Chien – potato starch fried with eggs and oysters. Found a random Kah Kah Oyster Omelette stall opposite the famous Penang Cendul shop, and was surprised how fluffy the starch mixture, fragrant the omelette and fresh the oysters are. An oily guilty treat nevertheless, but worth its calories for now. 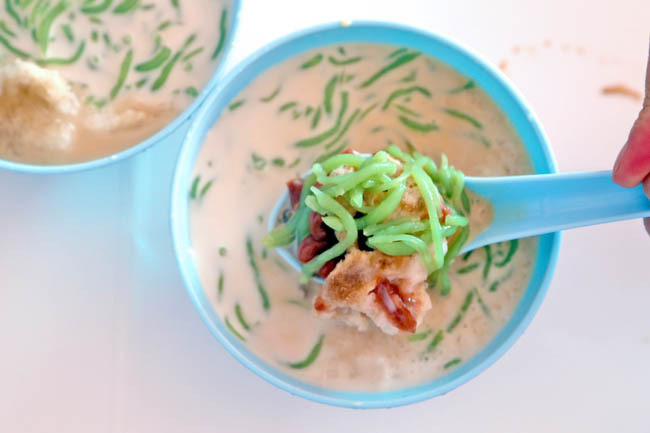 Penang’s usually hot all year around, and a bowl of cooling Cendol becomes a must-have. Containing jelly ‘noodles’ with green colouring from pandan, red bean palm sugar, and shaved ice, the freshness of the coconut milk makes all that difference. 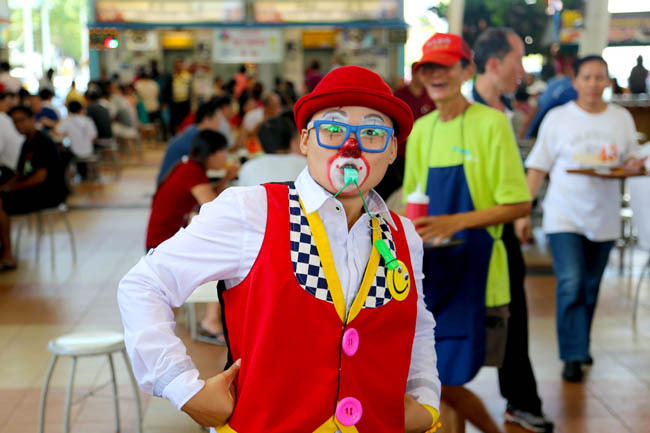 Tourists go for the Penang Road Famous Teochew Chendul, while the locals think otherwise. 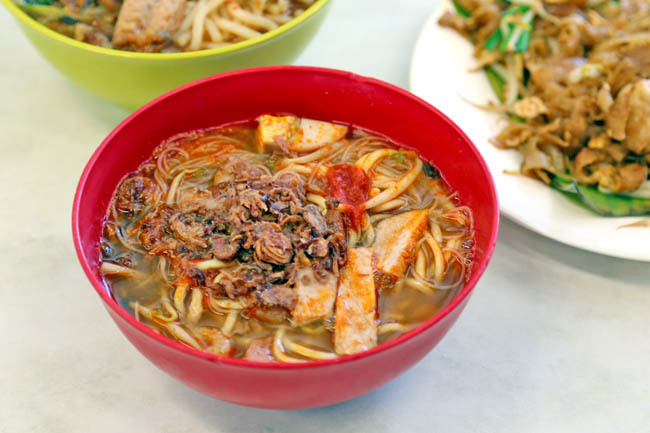 Hokkien cuisines are known to have a more intense and richer taste, thus expect the same from Penang’s Hae Mee. (Sometimes, people get confused because both the prawn noodle soup and fried versions are call ‘Hae Mee’.) 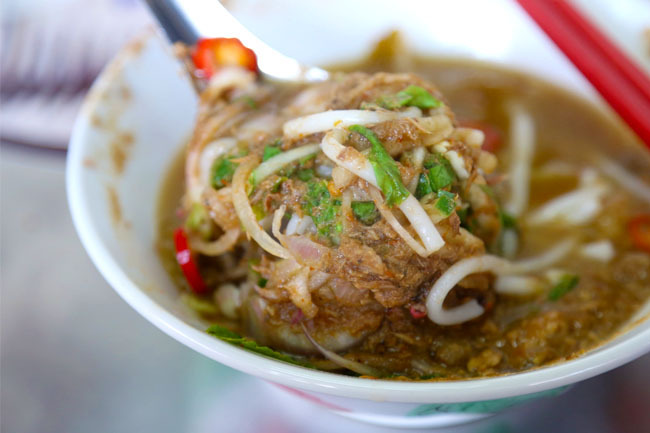 The broth is usually in a shade of orange, cooked by boiling prawn head and pork ribs for many hours, topped with deep fried shallot. Umami at its best. Thank you to my faithful travel mates who accompanied to try Wantan Mee every day. 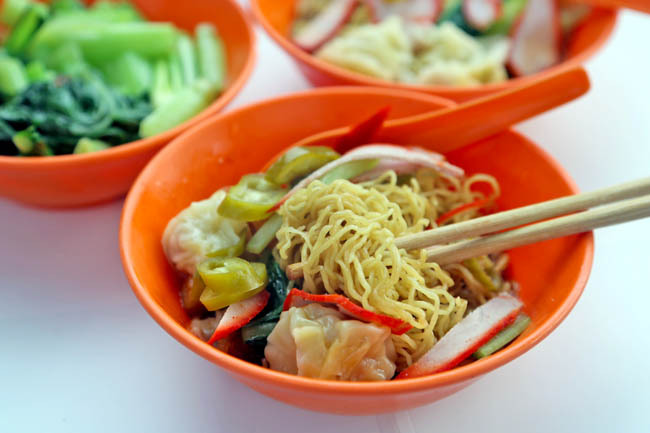 Penang’s Wanton Mee has an old-school style that I miss. Simple springy noodles with thinly cut roast pork tossed in black sauce, not forgetting the very fragrant pork lard. People around the world are snapping up MyKuali White Curry Instant Noodles, so why not try the real deal? 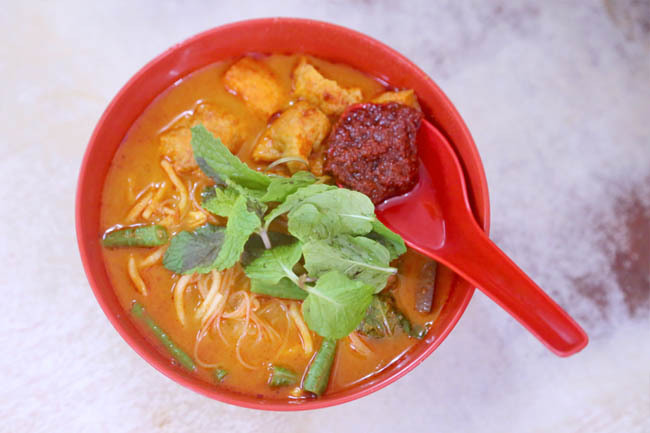 A dish quite unique to Malaysia, this has yellow noodles or vermicelli in spicy curry soup. Though Penang’s version is usually less milky and lighter. Some call this ‘ngo hiang’ or five-spice pork roll, though more commonly known as Lok Bak in Penang. Most Lok Bak stalls sell this minced pork roll along with other ingredients such as fishcake, prawn fritters, and beancurd – deep-fried and dipped in sweet and sambal chilli sauces. Before I talk about Rojak, you must know that Penang is very famous for its fermented prawn paste, otherwise known as ‘hae ko’. 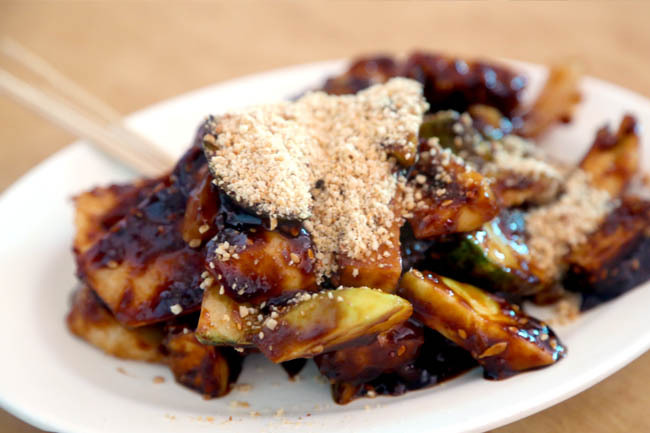 This thick sweet black sauce defines a good Rojak- which means ‘mixture’ in Malay. 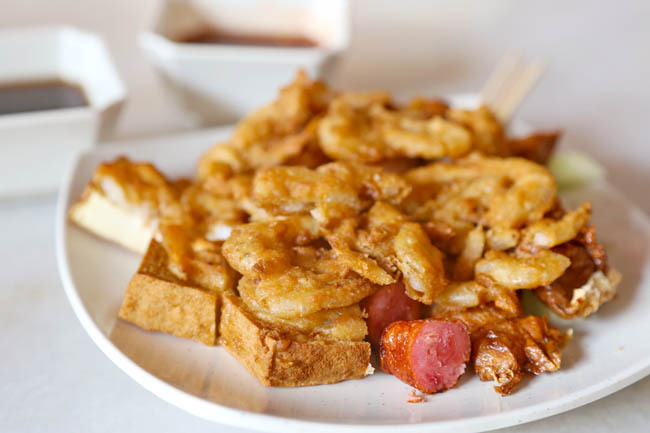 Penang’s Rojak would usually add fruits such as guava, raw mangoes and green apples, and omit dough fritters and beancurd puffs. Imagine refreshing fruits with salty thick black sauce. Ah-hah. In simple words, this is pancake. But wait till you try this. My guide recommended Anson Road’s as possibly the best mang chang kuih in town. Had the ham, cheese and mayo. Prepared by a 3rd generation owner, his grandpa, his papa also sold these pancakes. He was originally a hair stylist who decided to take over his family’s stall. We are kind of glad he did. I must thank my driver Alex, people we meet on the streets (Just ask. Penang people are very friendly! ), and several friends for their food recommendations. Sorry everyone, I won’t be providing the driver’s contact, as I am not entirely sure if his company would be the best recommend. But you can easily google for good Penang tour guides. Have fun feastig! Coconut-y, milky, sweet…. think very diluted milk shake? Possible to advise me ur driver details? Wish to find a guide to bring us ard Penang. Hi Suet, I have emailed you. Please check your inbox. Thanks for such a wonderful detailed guide! Looking forward to trying some, if not all of your recommendations. It’s our first trip to Penang and with 2 young kids, it’ll be great if you could kindly pass me the number to your friendly local guide. Although, I do see that quite a few people have asked your for it too. Hee hee. Hopefully he wouldn’t be booked up when we get there next week.. Anyway, it’ll be great if you could email me his contact too. Thanks in advance! 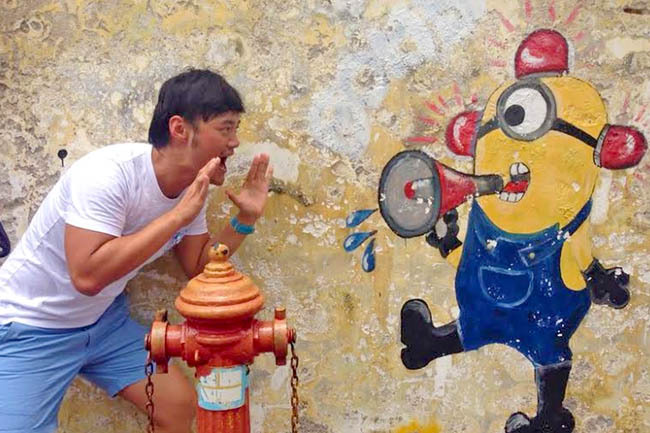 Hi Jasmine, I am sure you will enjoy Penang, and have fun exploring the street art with your children. 1. They don’t call prawn noodles Hae/har mee there, if you ask for that they will send you our version of Hokkien Mee. If you want prawn noodles, ask for Hokkien Mee instead (its the other way round, i know, its confusing). 2. They don’t call it Orh Chien there as well. Mostly people refer to it as Orh Luah there. but Orh Chien might work. 3. 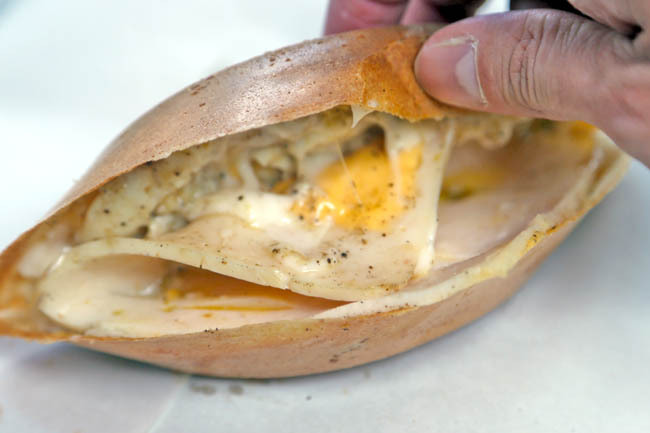 Lastly, its LoR Bak, not LoK Bak. And the sauce thats more preferred and supposed to taste is better is the ‘Lor’ sauce (together with chili sauce for more kick), hence they call it Lor Bak rather than Ngo Hiang. Hopefully anyone that goes there can sound more ‘local’ when ordering and get the correct food you ordered with these info. Can I pls have your driver contact details too? I’m heading to Penang next week with my whole kampung and we’ll definitely be checking out these recommendations. hi, possible to email me ur driver’s contact? will be gg to penang in jan 2015 so wanna check out ur recommendation. I’m planning a trip to penang in Dec. I can pls have your driver’s contact? Can’t wait to try your recommendation! Could I please have the driver’s contact as well? Thanks. Can I have the driver details too ? I will be going to Penang next week. Wanna try the good local food. How about asam fish head ? Any good recommendation. Hello! Thanks for the hawker food write up! am heading there in Nov with my brood too. May I have your driver’s details? Hi, can I have ur driver’s details too? Heading there this weekend and in Jan too! Thanks ! Can you PM me your driver details as well. Going next week! Hi Daniel, thanks for your sharing. My family will b gg penang next week, can u share with me the contact of your local guide? Thank u in adv. love this love. Can share your driver details too? Going in Dec and if you don’t mind can share the rates. Thanks! If you are anywhere near the Nyonya Heritage Mansion, just visit Wah Pin Coffee Shop for the fish noodle soup. It is good and reasonable priced. Also try the in-house coffee. Hello! Thanks for the awesome review. I will be visiting there next month. Can I have the driver’s details too? Hi Daniel, may I have the contact of your driver. Thanks a lot! Can I have your driver contact? I will be visiting Penang. Appreciate if you can share ur driver details! Can I have your driver’s contact too. Thanks! any chance of getting our driver’s number? Will be swooping in penang next week. Hey Daniel, please can I have your driver’s contact too? Will be heading to Penang next week. Many Thanks in advance! Can I have the contact number of your driver? Thank you! Possible to share your driver details as well? Thanks in advance! Hi, Please send me your driver’s contact too. Hi Ann, I do not provide my driver’s contact anymore, because I do not want to come across as endorsing his company and services (as there may be better and more reasonably priced ones out there?) Have fun with Penang! Hi alex, are you penang local guide? possible to share the local guide number? will be going in 2 weeks time. Hi Dickson, I do not provide my driver’s contact anymore, because I do not want to come across as endorsing his company and services. Hope you understand. Have a good trip! Hi Daniel, can i have your driver’s contact as well? Thank you in advance. I am from Sarawak and plan to take breakfast at Kedai Kopi Swee Kong around 6.30am. From Cititel Express to Kedai Kopi Swee Kong in early morning, what is the best mode of transport? Is it far to walk and is it safe (say at around 6am)? Or if I drive, is it easy to find parking space near Kedai Kopi Swee Kong? You can get a private driver if you want to cover as many places as possible.